Across Your Face: Must love cats? No Problem! Sorry for no posts the last few days, my brother and sister in law, their significant others and new born babies have all been staying at my house the last few days. So it's been non stop "activities" and bringing them all around to show what the Bay Area has to offer. Basically, hectic as all hell. So before we go to the beach, let me do a quick post. 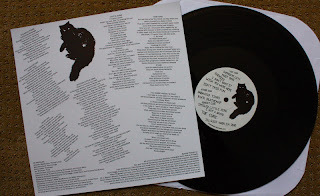 Here is No Problem's "And Now This" LP on Deranged Records. Plain old black, not sure on pressing info. Very solid '77 style punk but with a bit of a harder edge to it. I'm liking it! This is not your cookie cutter '77 punk, it's far from poppy and has some bite to it. Here is the "Paranoid Times" 7" on black on Handsome Dan Records. Here's the "Your Eyes" EP on a beautiful Orange. They also have Gary Bussey on vocals, which is always a good thing. Also on Handsome Dan Records. I was listening to this band for the first time as I came across your post. What a coincidence. This is a great album!